Master bathrooms are private retreats designed for comfort, safety and aesthetics pleasing to the users. 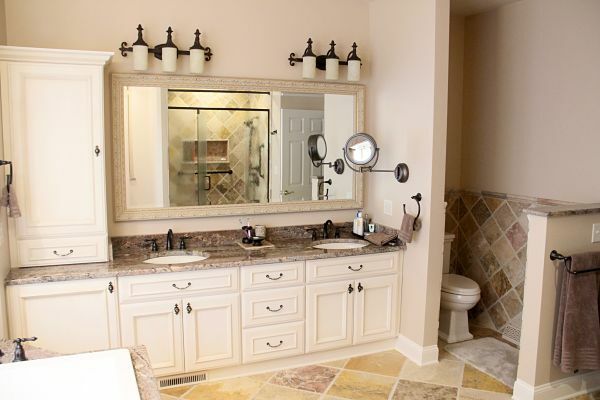 The owners of a home in Jamesville, NY wanted to update their master bathroom, which was a style from 20 years ago, with new fixtures, cabinets, lighting and tile. This month’s featured project is from a colonial style home built in 2000 in Manlius, NY. The home’s small, narrow kitchen had become outdated and inefficient. Working with the homeowners, we redesigned the kitchen and added new space to create more storage, seating, workspace, and a place for people to gather. 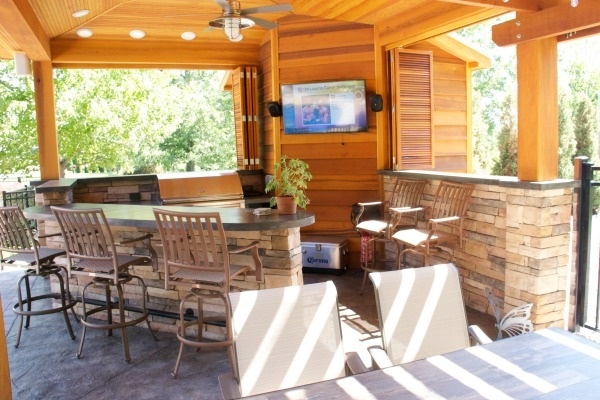 A poolside pavilion with a bar, outdoor kitchen, outdoor television and an attached pergola that serves as a sheltered dining area was built for Manlius homeowners who enjoy entertaining and outdoor living activities. Project planning began during the winter months. The work started in April and was completed in time for a Fourth of July celebration. A bathroom in a classic colonial home built in 1921 was completely renovated to become a comfortable, updated master bathroom retreat. 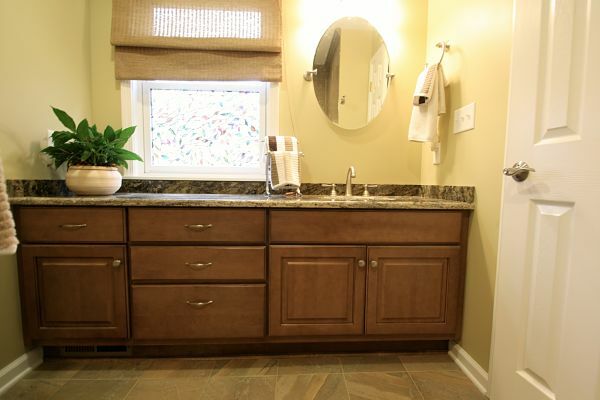 The bathroom was expanded by incorporating space from an adjacent linen closet into the room. The bathroom was stripped to the original framing. Old blue fixtures that date back to the 1980s were replaced with a double vanity, a sleek new toilet and a spacious walk-in shower. New flooring, lighting, ventilation and cabinets were installed. The project took about ten weeks to complete. 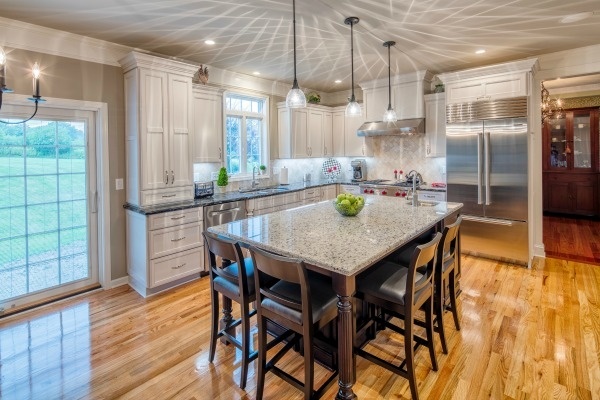 For many homeowners, the architecture of their house and personal design preferences are important factors in their remodeling plans. 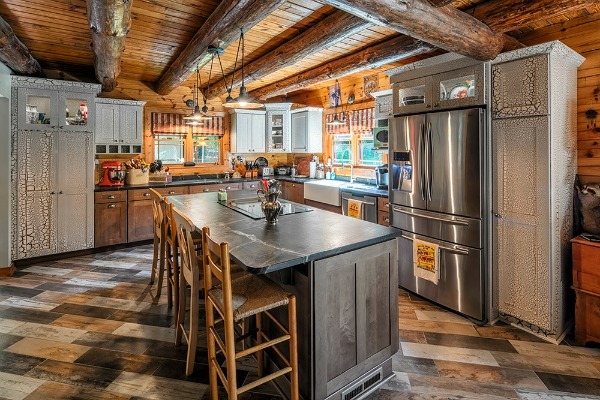 This month’s featured project is a kitchen remodel that transformed a log home built in 1986 by adding elements reflecting the style of the home and the owner’s design preferences. 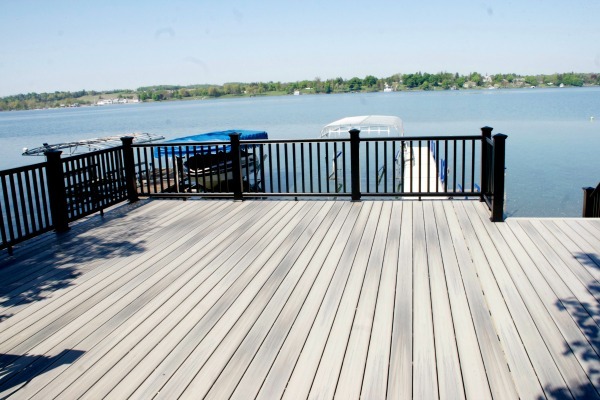 We worked with owners of a home located on Skaneateles Lake to design and build a new permanent dock and freestanding deck area. Projects on lakefront homes can often present a challenge due to the elements, environmental factors and zoning ordinances. Skaneateles Lake is pristine and protected. Building codes and land use are very strict and must be addressed in the design prior to applying for permits. Small changes to our homes can make a major impact in a room and the way we use it. 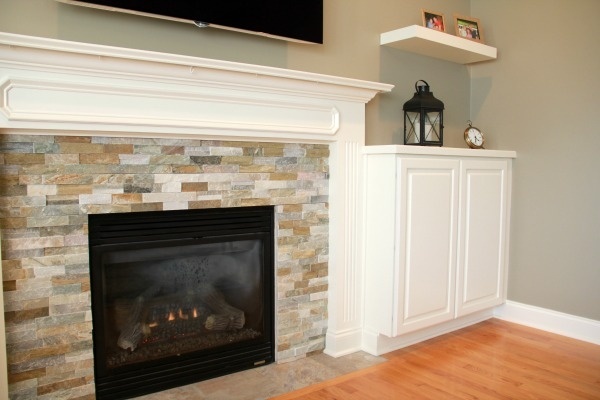 The owners of this Jamesville, NY home, built in 2003, decided to change the look and function of their living room by updating a fireplace with built-in cabinets, display shelves, a flat screen television placed over the mantel, a new stone veneer fireplace surround and a stone tile hearth. What inspires you when you think about home décor and areas of your home you would like to change? Is it a piece of artwork, a particular style of interior design or a need to reconfigure a room to better meet your needs? A busy professional couple in Jamesville, NY found their inspiration to remodel their master bathroom through a painting they owned and their need for a larger shower, more storage space and comfort. 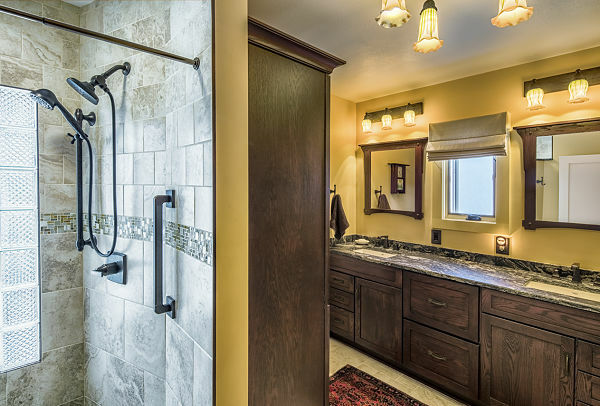 A master bath is a homeowner’s personal space. When a bathroom doesn’t meet the needs of the users it may be time for a change. 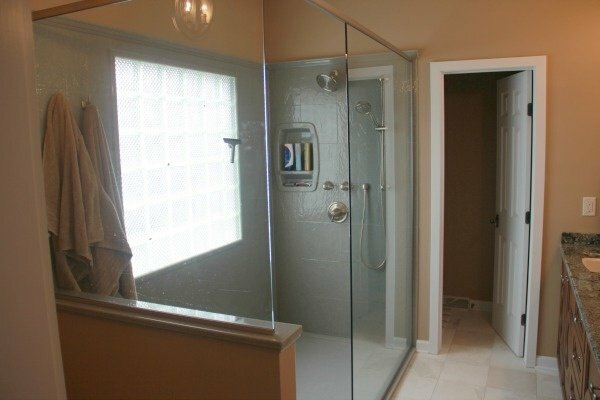 A master bath in a Jamesville, NY home that was built in 2000 did not provide a comfortable retreat for the homeowners who prefer a walk-in shower to a tub and wanted to add a heated floor. We worked with them to redesign the bathroom and the way the space functions for them. Bathroom trends and lifestyles change over time. 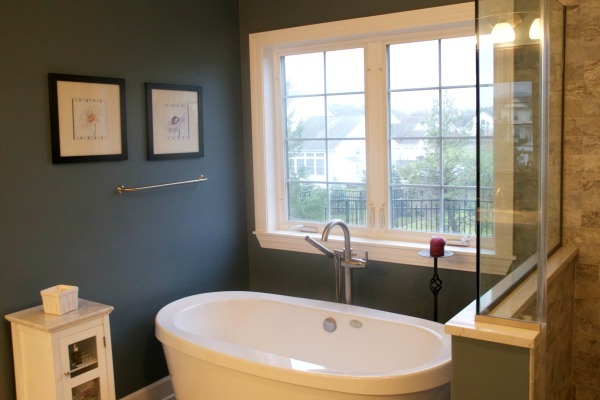 In the 1980s and 1990s desirable features in a master bathroom included a large whirlpool tub and a small shower. A dressing area with a vanity, where a woman could be seated to apply her makeup, and brass finishes were also trends. 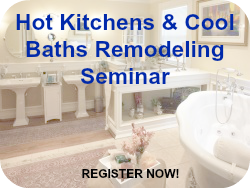 Today, comfort and easy maintenance are important in bath design. Our Project of the Month features a late 1980s-era master bathroom in Manlius, NY that was completely remodeled to provide a practical retreat for the homeowner. Updates include an expanded vanity, a private area for the toilet and a walk-in shower without doors that can be turned on by a remote control unit.